On tasting the flavours of being a Winner. I was addicted to my failures. Not because they were good. But their coming was so grand. I had to work really towards it to make it a win. Each one of us is a winner in our own way. What matters is if you see your failures worth to put you up to where you are or where you want to be. Winning is a very relative concept, for a labourer, earning bread for each day could be a big win but for an industrialist, losing a multimillion contract could be just another day. Stepping out with an intent to embrace your failures is what makes you a winner. No one can be a winner always, if it is about a genuine effort than it will be accompanied by a lot of failures and a big win! Author's Note: They say that failures are the stepping stones to success. In big pursuits, failures are often regarded as big milestones only winners find on their way to success. P.S. : When I look back at my life, I see hardship. At the same time it was accompanied by a belief that it will not get worse than this. It will get only better. I have had my share of failures, my share of losses but the lessons that accompanied those failures made me a winner. P.P.S: Do share your success on the comment box, with a little flavour of failure. Glad that you did it. When you do what you want, you are likely to win and are already a winner in your eyes. Failures make you feel weak at first but then when you rise up, you become stronger and a winner! Just a few lines and you have made a point.. !! My philosophy is this: failure is OK as long as you learn something from it, and don't keep making the same mistake over and over. Failure means you might need to take a different route toward your objective. I completely second your point. A little change in approach can make all the difference. Thanks for visiting! Good point! New follower here. 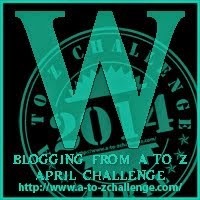 I'm stopping by from the "A to Z" challenge, and I look forward to visiting again. Good thoughts.. refreshing post ! Probably I am currently going thro a lean patch which is akin to failures to me...a win might be just at the corner. Thanks for this motivating post.